In the beginning there was a cloud of gas. Then came the lightning and it was condensed into a primodrial soup. A spark that gave origin to the first forms of life on planet Earth. At least that's the scientific version. Artist Kent Michael Smith has his own view of the universe, which he explains without the need for formulas or theories, but with just imagination and paint. In his canvases its as if something were growing, or perhaps it has already hatched but we haven't realized yet. From this whirling organic pond of matter, similar to a brilliant sediment of mud, series of stratified monochrome crsytals stand out: painting mineralizes and sublimates itself through graphics. Observing his paintings is like watching the slow and relentless evolution of each work as if through the glass of a fish tank. Each gesture is deeply visible, each brush stroke a trace suspended in a sea of liquid resin. New American Painting has just released their new website design. Below is a screen-shot of my feature from issue #102, 2012. Click here to view the site for yourself! Carrie Secrist Gallery is pleased to present an exhibition of new work from Kansas City, featuring Anne Lindberg, Kent Michael Smith, and Paul Anthony Smith. The exhibition is on view from June 8 to July 27, 2013. Our summer exhibition highlights and further develops cultural relationships between artist communities in Kansas City and Chicago. While the exhibit does not celebrate regionalism, it does underscore modes of contemporary practice in the Midwestern United States. 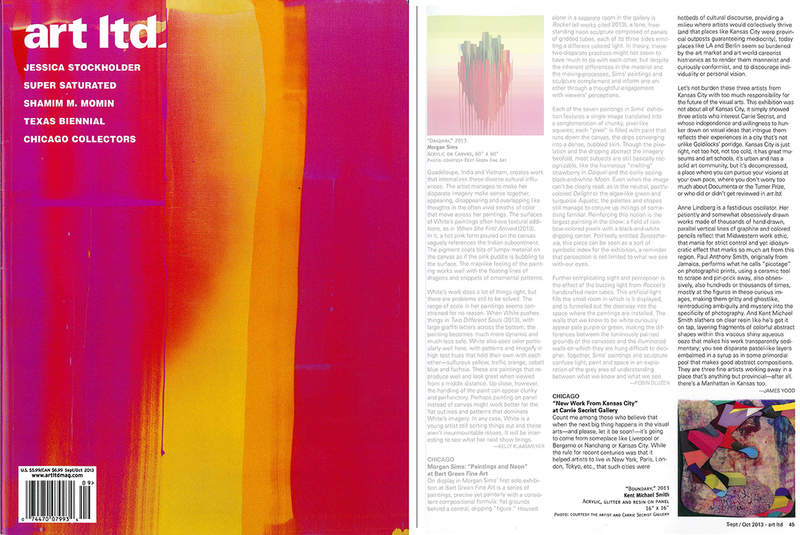 Through individual applications in technique, form and content, Kansas City-based artists Anne Lindberg, Kent Michael Smith, and Paul Anthony Smith form an anthology of work that coalesces abstraction and impression. Their two dimensional works originate a space that interrelates by referencing perception, examining cultural impact and background, or exposing self-identity. Gallery artist Anne Lindberg is a mark maker who examines the distinction of drawing as noun and drawing as verb. Composed of tightly spaced lines that vary in density and darkness, Lindberg’s labor-intensive graphite and colored pencil drawings vibrate and shape shift. The artist writes meaning into the lines and spaces of each indexical image. For Lindberg, abstraction is a means for self-portraiture; the repetition of marking a single line acts as a device to render internal thoughts into an external language. Kent Michael Smith’s paintings are bold and colorful; they combine gestural fluid abstraction and geometric patterns to create harmonious, yet jarring textures. Layering paint with epoxy resin unifies disparate forms of mark making, at the same time giving the paintings a sculptural quality. Abstraction created in the flatness and implied depth of Smith’s pictures behaves as a camouflage for unwelcoming populaces. Kent Michael Smith, like Anne Lindberg, employs abstraction to expose introspection. Lindberg’s dense line drawings represent the trickle of her innermost reflections, which she calls “private, vulnerable, fragile, and perceptive to the human condition.” Kent Smith’s juxtaposition of graphic, vivid and multicolored motifs atop more neutral backgrounds emanate conflict. Smith constructs these conflicts to mimic the historical and current apprehension of community members to welcome outsiders. Smith’s intention to illustrate this tension is emblematic of societal issues such as immigration and gentrification. Manipulated photographs by Paul Anthony Smith investigate autobiographical, ancestral, and cultural self-identification. For the works in this exhibition, Smith employs a technique called picotage, wherein he uses a ceramics tool to pick away the top layer of photographic images. Referencing African scarification and masking, these tears shimmer as if flecked with glitter. His obscured black figures are abstracted cultural portraits, feeding the artist’s interests in family history and heritage, as well as his broader research into African Diaspora. Both Kent Michael Smith and Paul Anthony Smith emphasize the estrangement and history of different cultures. While Kent Smith’s practice accounts for a broad spectrum of conflict within an archetypal community, Paul Smith’s work engages his own social history and descent from Jamaican emigration. In the physical alteration of his portrait photographs, Smith distorts the skin of black individuals. This powerful negation unifies the subjects of his portraits, acting as a tribute to his personal ancestry. Paul Anthony Smith and Anne Lindberg, in particular, art-make in visual and theoretical harmony. Both utilize meticulous and rhythmic techniques to emphasize the conceptual background of their practices. While Smith repetitiously carves away the top layer of each photograph in a precise, exhaustive pattern, Lindberg uses a systemic repeat of compact lines. Smith scrapes away bits of photographed skin to accentuate the importance of ancestry to his own self-identity. Lindberg brings her pencil across the cotton board again and again to create a visual language to match the intimate depths of her psyche. Together the two artists work with labor-intensive methods of making to bring light to their beliefs and subconscious perceptions. Gallery artist Anne Lindberg is a 2011 Joan Mitchell Foundation grantee. Her exhibition history includes projects with the Nevada Museum of Art, Reno; Bemis Center for Contemporary Arts, Omaha; Nerman Museum of Contemporary Art, Kansas City, and Bom Retiro Cultural Center, Sao Paulo, Brazil. She is currently completing a commission for the General Services Administration’s Art in Architecture program. Paul Anthony Smith is the recipient of a 2013 Charlotte Street Foundation Visual Artist Award and a 2013 ArtsKC Inspiration grant. He will participate in the Art Omi International Artists Residency this summer and debut a solo museum presentation this fall in Houston. Please contact Stevie Greco at 312.491.0917 for further information. Join us for the release of a 32 page book on the current exhibition, VIM. Featuring works from Ben Ahlvers, Archie Scott Gobber, Lisa Lala, and Kent Michael Smith, VIM accentuates distinctive qualities in materials, process and conceptualization while revealing relationships between the works on display. Through varied color and techniques the artists in this exhibition inject a high level of energy into their work. Ahlvers, Gobber, Lala, and Smith will be the featured artists at the 2013 Lawrence Arts Center Benefit Auction. Each artist will have select works from the VIM exhibition available only at the auction on April 13. 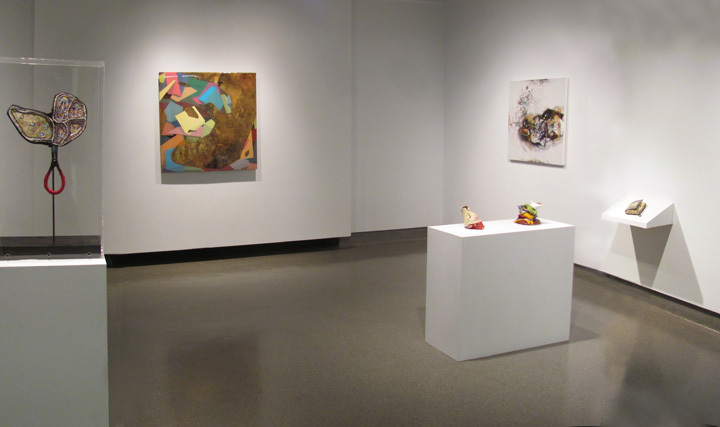 Six Kansas City painters are featured in “MIX” an exhibition opening January 28 and running through February 8, 2013 in Mark A. Chapman Gallery in Willard Hall on Kansas State University campus. Kansas State University Department of Art presents “MIX” an exhibition of six Kansas City painters exploring new materials and methods in contemporary painting and challenging the boundaries of the medium. Joe Bussell, Tanya Hartman, Amy Kligman, Anne Austin Pearce, Kent Michael Smith, and Larry Thomas are featured in this exhibition from Monday, January 28 through February 8, 2013 in the Mark A. Chapman Gallery, first floor Willard Hall. Gallery hours are 10am – 5pm, Monday through Friday. There will be a reception for the artists on Friday evening, February 8th, from 5:30 to 7:30 pm in the gallery. Nelson Smith, a painter and instructor in the Department of Art at Kansas State University, is the curator for the “MIX” exhibition.